Readers, I just received notice from the Washington State Historical Society that they have extended the deadline for award nominations to May 15. 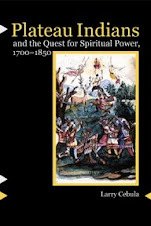 If you have visited this blog, you surely know someone who is doing excellent historical work in Washington State. Why not take a few minutes and nominate them for one of the awards below? Click here for a nomination form, and here for a printable list of awards. For further information about the awards program, contact Mary Mikel Stump, Director of Audience Engagement, at (253) 798-5878 or email: marymikel.stump@wshs.wa.gov. Washington State Historical Society employees are not eligible for the awards. To submit a nomination please download the nomination form and return via email to Mary Mikel Stump. First given in 1968, the Robert Gray Medal is the highest award bestowed by the Washington State Historical Society. It recognizes distinguished and long-term contributions to Pacific Northwest history through demonstrated excellence in one or more of the following areas: teaching, writing, research, historic preservation, and service to local historical societies. The winner receives a framed Robert Gray Medal with a certificate. First given in 1975, one of the two Peace and Friendship Awards is presented to a Native American and the other to a non-Native individual who has advanced public understanding of the cultural diversity of the peoples of Washington State. Winners receive a framed President Jefferson Peace and Friendship Medal with a certificate. If nominating for both awards, submit separate nomination materials. There used to be a great website about LGBTQ history in Spokane. I blogged about it. It included transcripts from dozens of oral interviews. It also had thematic excerpts from multiple histories, organized around topics like "coming out" and "nightlife." So when a researcher contacted me a few weeks ago asking about resources for LGBTQ history in Spokane, I knew exactly where to send her. But the site was gone. High school teachers of northwest history used to have an excellent resource, an online course called Time Travelers. It had video lectures by a prominent northwest historian, thousands of maps and documents, interactive timelines, all manner of goodies. The most valuable part to me were the dozens of video oral histories from tribal elders and historians across the northwest, in which they talked about how their tribes fared during different periods of history. The site was built up over a decade or more by a dedicated team of scholars. Then it went away. The Internet Archive preserves only the top levels and little to none of the wonderful content. It used to be that if you were interested in the atomic history of Hanford, Washington, there was an app for that. Stories of the Reach was a Curatescape site and smartphone app with dozens of interviews from experts and Hanford workers. But it does not exist anymore. Collectively these projects represent thousands of hours of effort by dedicated, passionate scholars, and each was an irreplaceable resource. I discovered there absence, one after another, in a three week period, and it has me thinking about digital projects and sustainability. What can we do to future-proof our digital work? I don't know. In the case of these three, I am in touch with the creators and trying to figure out how to restore them. But what other sites are disappearing? A couple of years ago, Google's long-abandoned Google News Archive became exponentially less useful when the search feature stopped working. It apparently is not coming back. 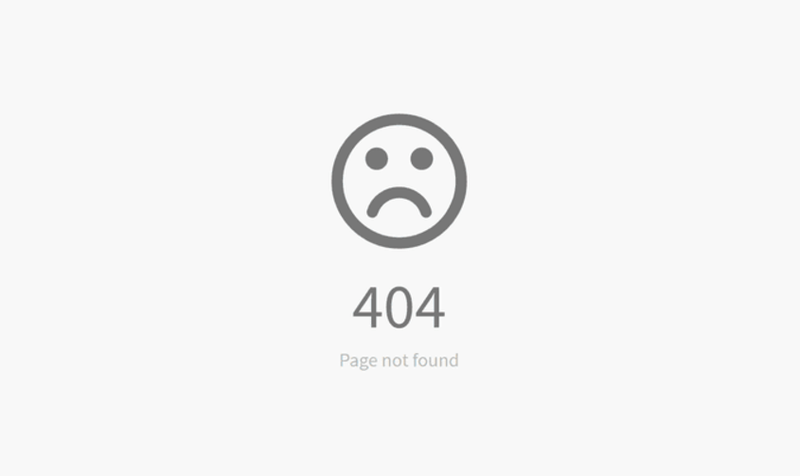 The Internet Archive's Wayback Machine preserves some web pages, but not the streaming media or the search or other functionalities. We need to do better with sustainability. This volume titled "Photographs of Criminals" served as a record of individuals arrested by the Vancouver Police Department between 1896 and 1940 (bulk 1906-1940). Records may include a photograph, name, alias, inmate number, residence, nativity, occupation, criminal occupation, age, personal description, date of arrest, where arrested, crime charged, past record, and disposition of case. After arrest, these individuals may have spent time in the city jail, or may have been transferred to another facility. The photographs were not always taken by the Police Department, but provided by outside resources. The book includes photographs of 718 criminals, the bulk of them arrested between 1908 and 1922. 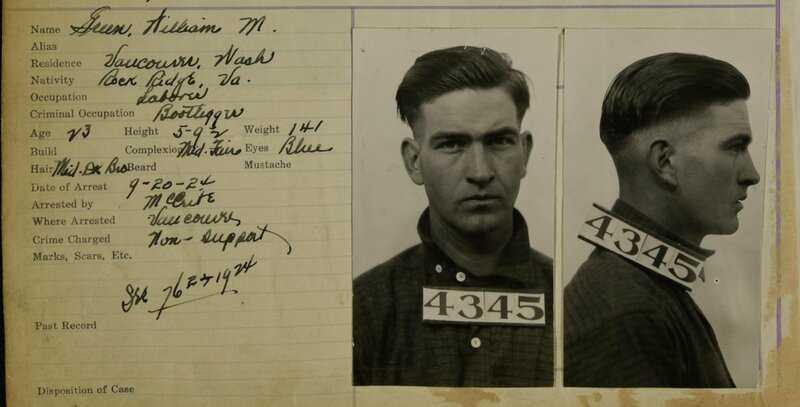 The carefully handwritten records that accompany the mug shots include names, known aliases, a detailed physical description, and the crimes each was charged with. It is a goldmine of information. Fred Bonehart, aka Fines Brown, aka Ernest Hunter, was a much harder case. A burglar and "yeg" (safe cracker) his career was interrupted by prison terms in Wisconsin, Oregon, and Idaho. Extensive tattoos. "Residence: no where." Many of these records are quite sad. 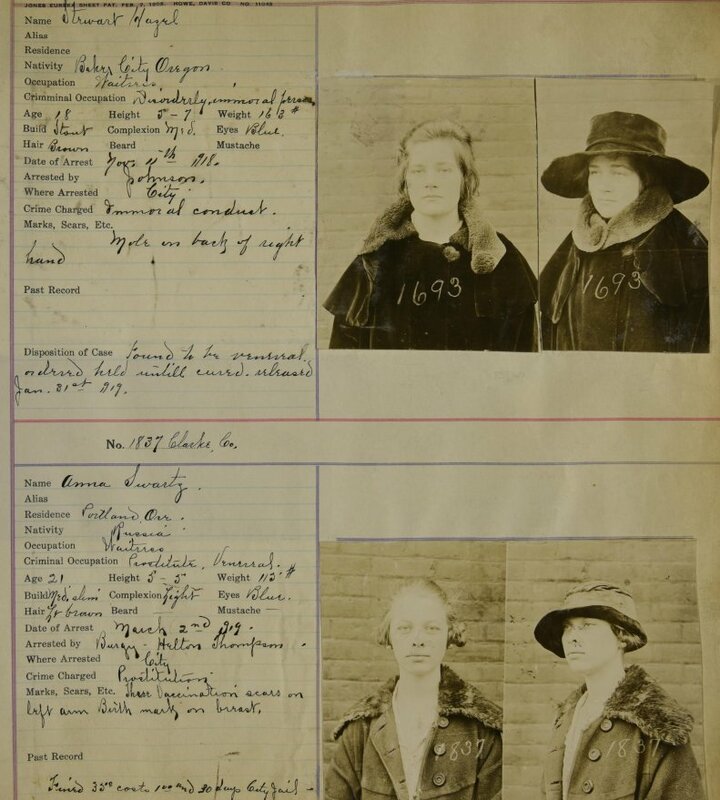 Alice Collins, a prostitute was arrested in 1918 for "Immoral conduct. Venereal." She practiced her trade at the Abbott House in the City of Vancouver, Washington. There seems to have been a roundup of prostitutes in Vancouver, WA in 1918. Here are two more who were arrested: Anna Swartz, born in Russia, and Oregon native Hazel Stewart. 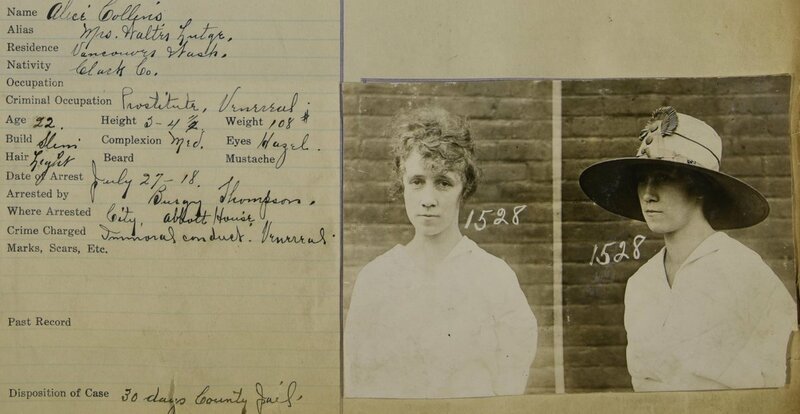 Both were identified as venereal and to be "held until cured." Though William Green's "criminal occupation" is listed as "Bootlegger," the reason for his 1924 arrest is given as "non-support." 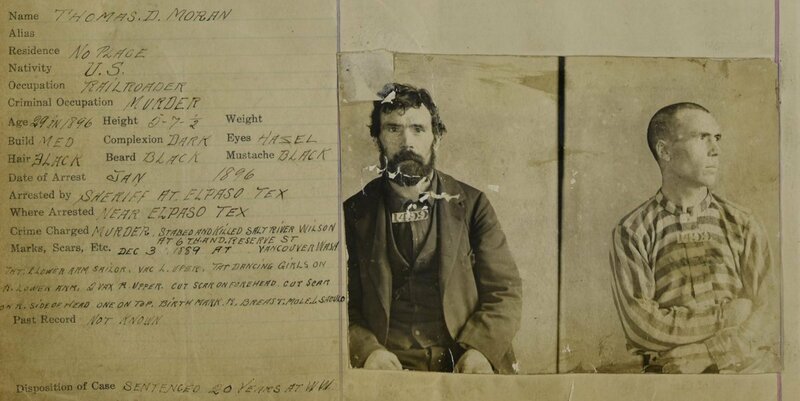 The oldest indexed mugshot is of Thomas Moran, who committed a murder in Vancouver in 1889 and was arrested in El Paso in 1896. Moran was sentenced to 20 years at Walla Walla. In an age before fingerprinting and universal IDs, police took careful note of identifying "Marks, Scars, Etc." Tattoos, when present, were a particularly useful identification. I wonder if it was the "TAT DANCING GIRLS ON R. LOWER ARM" that gave Moran away? This record series can be leveraged with other digital resources, like the Chronicling America digitized newspaper collection. Here is a story about Moran's escape from the November 28, 1904, Wall Walla Evening Statesman. This record series has tremendous classroom potential. Students will be drawn to the subject matter. They could research how different crimes were punished, the backgrounds of the criminals, even early 20th-century criminal attire and tattoos. This record series could be leveraged with other digital resources such as newspapers, census records, and city directories to tell larger stories. I can't wait to try it out. Finally, this record series poses a question: Where are the other mug books? Surely, every municipal police department of that era had similar mug books? Most would not have survived, but surely Vancouver cannot be the only one. Reader, do you know where any mug books are?